Mysterious groups flood Phoenix races Of the roughly $3 million spent in this fall’s Phoenix City Council election, nearly a third came from independent-expenditure groups, outside entities that face fewer financial-disclosure rules than candidates. 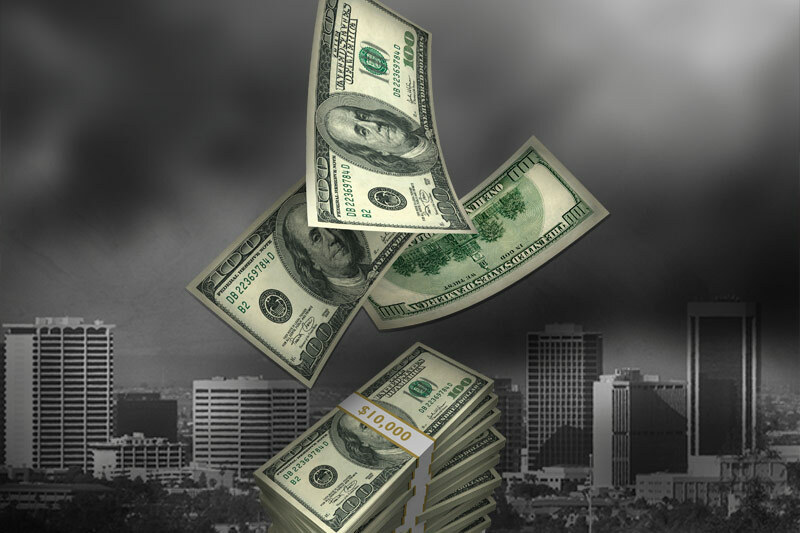 Political observers said the total raises concerns about the growing prevalence of “dark money” in city elections. As local contests have become increasingly high-profile, many worry the money trail has become more opaque. A 2010 U.S. Supreme Court decision in the Citizens United case has opened the floodgate for independent-expenditure groups to spend unlimited amounts of money campaigning for or against candidates. Many groups, including unions and corporations, can now spend without ever having to report their donors. Earl de Berge, a Valley pollster, said the amount and type of money flowing into city elections suggests Phoenix is “in the big leagues,” at least politically speaking. However, he said the difficulty of tracing the source of political contributions raises red flags, and he’s noticed a partisan tone to the campaign-spending war. “Anytime you mask or cloud the source of money in politics, I think you open the door for corruption,” de Berge said. Although the groups face fewer restrictions, observers said these organizations often flout the ones they do face. Nearly every council race on the ballot this year involved accusations of illegal conduct on the part of independent-expenditure groups. And some of the players involved in the races complained that the City Clerk’s Office did not fully investigate some complaints or waited until after voters cast their ballots. Political consultants from several campaigns said the lack of strict enforcement efforts has created an environment where operatives can bend the rules with little consequence. They said though the growing role of independent-expenditure groups is a national trend, lackluster enforcement of the rules has exacerbated concerns about transparency. Deputy City Clerk Ben Lane, who oversees Phoenix elections, said the city tries to handle complaints in an expedited manner but faces challenges because of the growing number of accusations. He said the Clerk’s Office has a small elections staff and must give those involved a fair opportunity to respond to allegations. Meanwhile, the law still limits candidate campaigns in how much money they can accept from individual donors or political committees. They cannot coordinate with the independent groups supporting their election. An Arizona Republic analysis of campaign-finance reports shows that independent-expenditure groups spent about $940,000 on council contests this year, compared with about $1.93 million spent by the candidates. The total doesn’t include several groups that spent money in the election and never disclosed their expenditures, a violation of campaign-finance law. Residents experienced the influx of money from outside organizations in the avalanche of negative campaign mailers, signs and robocalls during the election. Independent-expenditure groups played a heavy role in the contentious runoff election for the District 4 council seat in central Phoenix, where educator Laura Pastor defeated builder Justin Johnson. Records show Pastor received the most support from independent organizations, principally unions. But a group that supported Johnson has generated controversy as city officials investigate a complaint it illegally coordinated with his campaign. Pastor’s campaign filed the complaint in October, saying the committee and a firm producing mailers for Johnson’s campaign appeared to have the same postal mailbox address. State law says consultants and other “agents” working for a candidate cannot also work for an outside group spending money to further their election. According to campaign-finance records and Arizona Corporation Commission filings, a mail vendor working with Johnson’s campaign, Smarter Voter Project LLC, and an independent group advocating his election, Putting Phoenix First, were listed as having the same UPS store mailbox address for much of the campaign. Pastor’s campaign said the shared address raises the “strong likelihood” the pro-Johnson group and his mail firm are one in the same. Johnson’s campaign and Putting Phoenix First both denied the accusation. In a letter to the Clerk’s Office, an attorney for Johnson said the mail firm was incorrectly labeled a political “consultant” and merely provided printing and mailing services as a vendor. Kory Langhofer, an attorney for Putting Phoenix First, said the group and the mail company shared a mailbox in the past but had not done so for about a year. Langhofer said there’s no evidence his client and Johnson’s campaign ever coordinated their messaging. The mail firm’s owner, Alichia Moore, who could not be reached for comment, also signed a sworn affidavit stating she did not coordinate or consult with the independent committee. But The Republic found that Moore also was listed as having a phone number that appears to belong to Henry Jimenez, president of Concerned Citizens for Phoenix, a non-profit corporation that funded the pro-Johnson independent committee. The corporation was formed several years ago by Joseph Villasenor, a former aide to past Mayor Phil Gordon and a political ally of Councilman Sal DiCiccio. A man who identified himself as Jimenez answered the phone number listed for Moore on a website domain registry. Langhofer, who also represents Concerned Citizens for Phoenix, said Jimenez doesn’t share a phone number with Moore. He said Jimenez created the website for Moore’s company and used to have the same mailbox because the two worked together in the past. The Clerk’s Office continues to investigate Pastor’s complaint and will determine whether to forward it to the city attorney. Scheel, who worked on Pastor’s campaign, said the city hasn’t handled the complaint in a timely manner. The most complaints came out of east Phoenix’s District 6, where DiCiccio defeated insurance executive Karlene Keogh Parks. Firefighters opposed to DiCiccio’s re-election ran the most financially formidable independent-expenditure group. Phoenix Truth and Safety, a committee funded by firefighter unions, spent about $464,000 battling the councilman. DiCiccio filed a complaint accusing the group of not properly disclosing its donors on its website or newspaper advertisements and not providing him with copies of some ads naming him, as required by law. The Clerk’s Office found that there’s “reasonable cause” the group violated the law and forwarded the complaint to the city attorney for enforcement. But Roopali Desai, an attorney for Phoenix Truth and Safety and residents who filed a lawsuit against DiCiccio, said the clerk’s handling of various complaints surrounding DiCiccio raises questions about the office’s impartiality. She said allegations against DiCiccio have languished for months while City Clerk Cris Meyer quickly forwarded the councilman’s complaint against the firefighter group. Desai said the city never granted Phoenix Truth and Safety its due process because the group hasn’t had an opportunity to respond to DiCiccio’s allegations. In another case, a political activist filed a complaint in June accusing DiCiccio of campaign-finance violations, including that he previously accepted contributions over the legal limit. The Clerk’s Office is reviewing those accusations, roughly six months later. Lane said the city hasn’t moved as quickly on the complaint against DiCiccio because the allegations are more complex and are related to an ongoing lawsuit, which Desai’s clients are appealing after a Maricopa County Superior Court judge dismissed it.